A thermostatic mixing valve combines both hot and cold water in order to produce a consistent temperature when it exits a faucet. Thermostatic mixing valves are engineered to maintain water temperatures. Not only are they designed to prevent accidental scalding, but they can increase the amount of hot water that is available. This device can control the output of water from both a faucet and from your shower. 8. Accurate temperature, error is within ± 1 ℃. *Easy Operation: You could get a warm shower as soon as turn on the shower faucet. Don’t need to adjust TEMP always. *Digital Thermostat: Auto keeps water outlet TEMP constant. *Precise TEMP Accurate water outlet temperature, TEMP accuracy is within 1 Celsius degree. *Overheat Protection: Water cut off automatically in 2 seconds when water TEMP higher than 50 Celsius degree. Without cold water, faucet can automatically turn off. *TEMP Adjustable: You can set TEMP from 29 to 45 Celsius degree. *Water Flow Setting: You can set water flow as you like from 3L to 13L on the panel. *Safety: Dual power supply system, more safety and reliable. 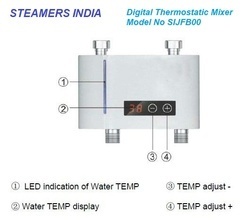 *User-friendly: You can set the water TEMP on the panel. Easy installation. Material Stainless Steel Shower Panel. – Made of 304-Grade High-Quality Stainless Steel. – Individual Controller for each function: Rain, Waterfall, Body-Jets & Button Spout. – Two or more functions can be used simultaneously as required. – Single-Lever Hot & Cold Mixer with Kerox Cartridge. Valve Core Material Single-Lever Hot & Cold Mixer with Kerox Cartridge.